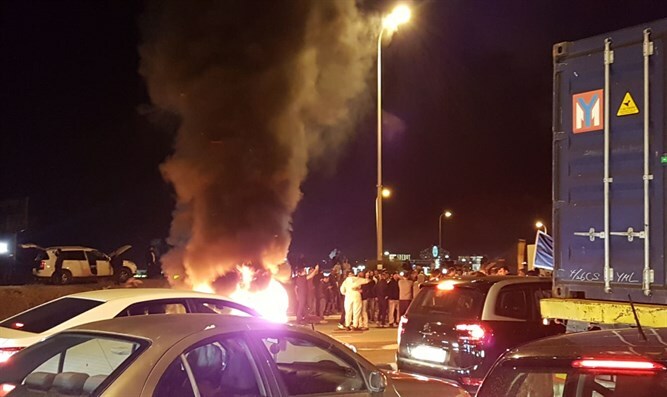 Residents of the Gaza periphery communities arrived Tuesday evening at the Sderot junction following reports that Israel reached a ceasefire agreement with the Hamas terrorist organization. Terrorists from the Gaza Strip have launched about 460 rockets and mortars at southern Israel since Monday afternoon. The residents, who are furious at the cabinet's decisions, waved signs, shouted protests and burned tires. The protests included signs with slogans such as: "We are not second class citizens." The police reported that police forces had begun operations to restore order, and that additional police forces were making their way to the scene. "The Israel Police will allow freedom of expression and protest by law, but will not allow and act by all means against public order, violence against police or civilians, and disturbances in main roads," the police said.